I spent the majority of my time in Bhutan travelling to the most common places any tourist would want to go to. Staying mostly in the western part of the country, I travelled through Thimphu, Punakha and Paro staying in homestays, eating local food, and exploring parts of these valleys that have been seen by few, all this while enjoying the hustle bustle of popular tourist spots that have been recommended a countless times throughout the world wide web. But during my last few days in Bhutan, I decided to take it slow, with absolutely nothing planned on my itinerary during my four days of stay in Haa Valley, Bhutan. During these days I even decided to ditch my camera, resulting in a lack of Haa pictures on my Instagram, but also in a bunch full of happy memories that I’m sure to retell for the rest of my life. We reached Haa on 31st December by mere chance because the connectivity to Haa is very limited. If you plan on taking the bus to Haa, you must ask about the schedule well in advance as the buses to and from Haa only run on alternate days. We were lucky to have a bus going on the day we decided we wanted to visit this beautifully secluded spot, and we hopped on! As was normally the case everywhere we went, our bus was filled with locals and we were the only outsiders who had decided to take public transport instead of hiring private taxis. Not surprisingly, we became the center of everyone’s attention and so we spent the entire bus journey listening to Bhutanese songs (that mostly sound like Bollywood rip offs) that our driver insisted we listen, and sharing some dry yak cheese or some whole tobacco, or another piece of paan offered to us by our bus mates! There is indeed absolutely nothing better than leaving luxury aside and experiencing a place the way locals do! 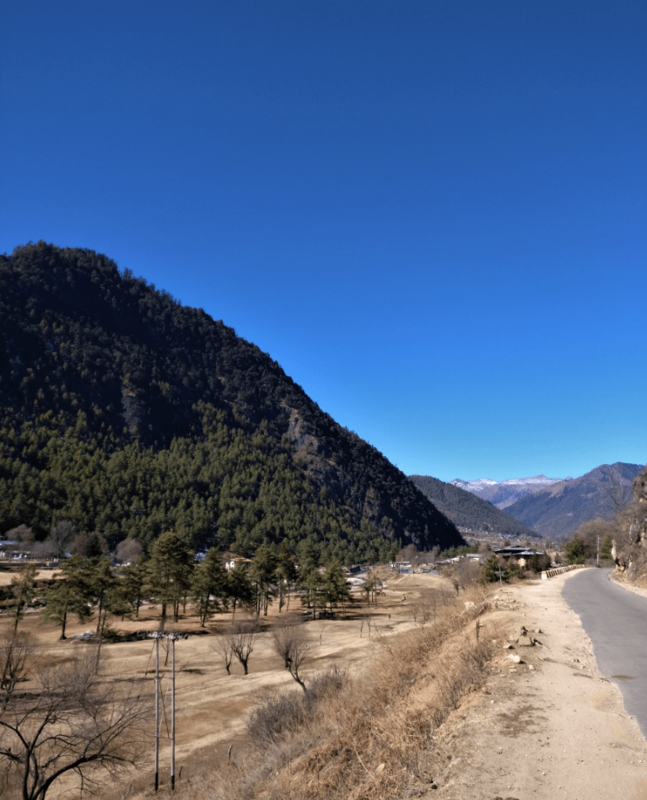 Haa is the highest district in all of Bhutan, with the highest motorable road being the Chele La Pass connecting Paro and Haa. In peak winters, the temperatures plummet to subzero as soon as the sun sets and the water in the pipes and the dew on the grass slowly start to freeze overnight. We had to make sure we switched on the geyser latest by 7 pm and left it switched on throughout the night, only to be able to access a small trickle of brain freezing water slowly making its way through the tap on the basin. Our morning routine consisted of filling kettle after kettle, trying to heat whatever little water we could collect to be able to brush our teeth and wash our faces. (Taking a shower was absolutely out of the question. Read: How I Spent 4 Days in Haa Without a Shower!) We would then get dressed and spend time lazing under the sun, waiting for the grass to turn back green from white. For lunch, we would lazily stroll up to the main town some 4 kilometers away and try out various dishes being prepared in the few small restaurants of Upper Market in Haa. More often than not, we would get distracted by this old bridge or that patch of frozen river on our way and instead spend hours climbing down bridges, sitting by the river, testing the hardness of the frozen river by throwing rocks at it and doing all other sorts of pointless but absolutely joyful things! On one such day, I came across a large patch of snow on the other side of the bridge from where the jungle began, with hardly any houses. Getting as excited as I usually do, I ran up the hill towards the snow only to find myself slipping on some transparent black ice and landing flat on my bum! On days when we actually did reach the market during lunch hours, we would feast on red rice and ema datsi or shamu datsi (my absolute favourite!) 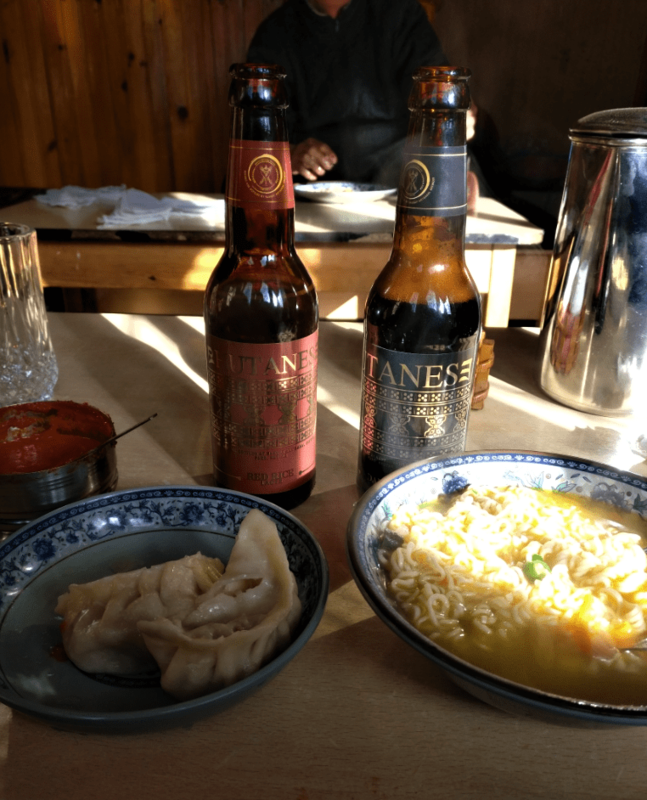 And on days when we would get late because of our childlike joys (like making snow angels on the top of a hill), we would accept whatever food there would be available like Koka Noodles (Bhutan’s version of Maggi) or beef momos or bread omelette, and happily wash it down with some beer. My favourite to this day remains the Bhutanese Red Rice Lager so much so that if I could, I would get cartons of it shipped to India. (@ Bhutanese Red Rice Lager are you listening?!) Our other food adventures included walking up to the IMTRAT canteen and feasting on their miniature potato puffs (or as we like to call them, aaloo patties). Apart from our food and ice adventures, we also had quite a few adorable (and one nasty) doggy adventures! 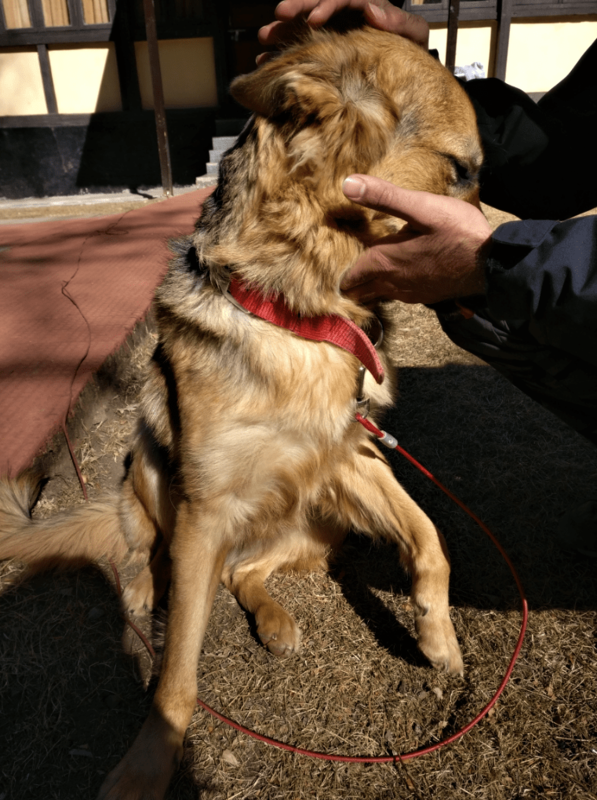 Our usual mornings included feeding stray dogs leftovers from the previous night and playing with our neighbour’s year old German Shepherd, Bella. What a floofball she was, every morning she would wait for her carer to open the doors so she could come running to ours and scratch on it with her paws to let us know it’s playtime! On one occasion we also delivered home what I thought was a lost, collar-less pet Labrador having the time of his life on the grass in the golf course. He, in fact, turned out to be just another badass pooch who happened to know his way home very well and would just walk out his door and go back in whenever he wanted, as per his convenience! On the lesser bright side, one of the wild stray dogs took a nip at Abbimnyou one early morning while he was running across an empty street, trying to catch our bus that was supposed to take us back to Phuentsholing. He just finished his month long course of anti- rabies shots two days ago! And before we knew it, our dog days in Haa were over and we were magically transported back to the hustle of everyday life back in New Delhi. My point is, give yourself a break from touristing around every now and then while you’re travelling. Doing absolutely nothing can also result in making memories worth penning down and sharing! 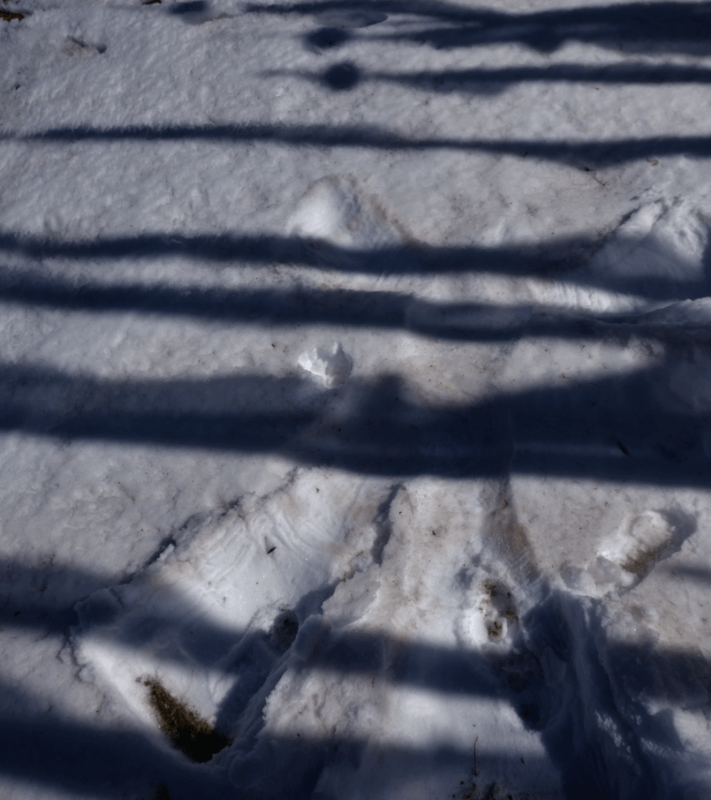 My snow angel at Chele La Pass! Haa Valley, like most other dzongkhags of Bhutan, requires a special permit. 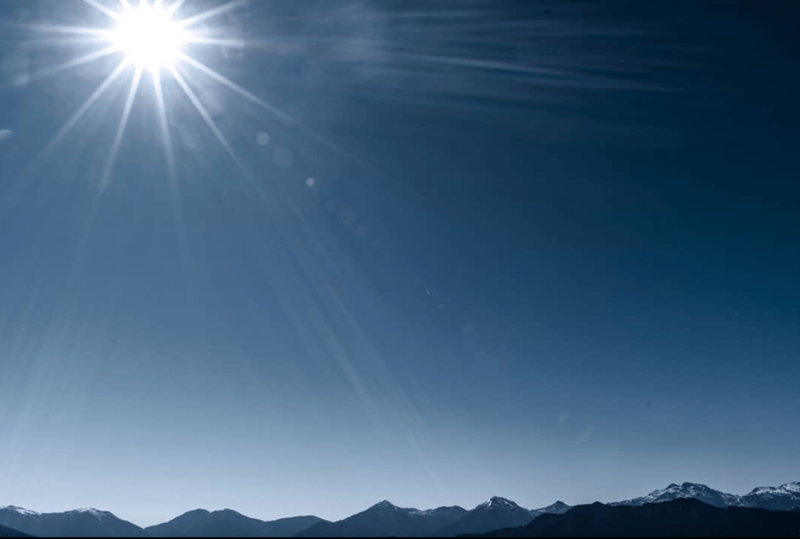 Learn how to acquire a special permit here. Taxis are very limited in this district. So be prepared to alter your plans according to the availability of taxis. Bus to and from Haa run only on alternate days. Make sure you check about the timings well in advance. There are limited restaurants/ cafes in Haa and most close by 2 pm. My favourite was New Lee Restaurant in Lower Market in Haa Town. They serve beer, are open well past lunch timings and serve delicious momos. Try their special dish, hoentay. It is only available in the Haa District.